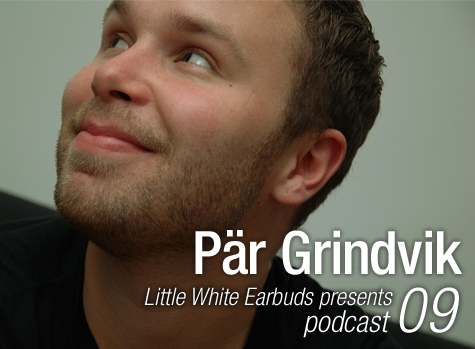 Read an interview with Pär Grindvik after the jump. Pär Grindvik: I recorded this mix in our combine bed/work/studio room in Berlin. I meant to come up with a well carved concept for this mix, as LWE and its podcast section means a lot to me! But suddenly time was gone and I just recorded it on the fly, grabbing some older favorites from the shelter that I’ve been thinking of lately and upon that I tried out new music that I received recently from some of the artists on our labels. I think that it turned out great and I would say that it continues a collection of music that inspire me right now, that’s why it’s called “Inspiration Take I” That and the fact that “Inspiration Take” sounds so Jamaican and dub. just as this mix turned out — bass, drums and a huge amount of reverbs and delays. Seth Troxler: It feels like he is the new Lil’ Louis. Romance and faith, love the way he collects gems from past and plays them with future sound of Seth. Cassy, Ben Klock, Marcel Dettmann, actually everybody at Berghain I would say. Having a coffee or a shot listening to any of the residents is a great start for a Sunday. Otherwise I love listening to podcasts like LWE, Beats In Space, Lazpod and the Bunker Podcast from New York. I will try to get some studio time in between all the traveling and label work. However, I have some remixes in the pipe line, one interpretation of Seth Troxler’s masterpiece “Love Never Sleeps” on Crosstown Rebels, the original is easily one of my favorite songs this year. Then I have one remix that I’ve done for a Swedish rock/pop artist called Tiger Lou. Not to forget, I will release a new record under my alias The Hollow on Stockholm LTD called “Treat Me Bad” which will continue where the last one “We Want It Bad” ended. People has asked me about this subject and I thought it would take ages before I went back recoding new The Hollow material, but then it just happened. And also I’m super excited about all new releases coming out on my labels Stockholm LTD and Islands and Islets. nice one. tracklisting looks the business. keep up the good work guys. that decimal track is HEAVY!! Really love his work! Love the whole podcast, but especially the beginning bits. does that tracklist jump all over? Noice, the eighth track is actually Aberrant- Kirkbride’s Dungeon (rekids).